Sanlitun is infamous. Tell any cab driver your destination is Sanlitun and they'll roll their eyes or click their tongue. that's because this is the expat area full of bars, clubs, fine dining, and tonnes of shopping. There isn't much cultural to do here other than eat, drink and be marry in a foreign land. There are very few cultural and historical sites around Sanlitun, as it's a modern area. But if the shopping, nightlife and dining get boring you could head to the Underground City for a peek at what goes on beneath the amazing modernity of Sanlitun. Get out of the glam and into the gunk for a peek at the sewers. The Kro's Nest is one of the better restaurants in the area for groups, though a reservation is required. Try Cheff Too, a delightful American eatery that has delicious steak. Blue Frog is another crowd favorite and their two-for-one burger deal on Mondays remains a Beijing tradition. Hatsune is a great Japanese and sushi place that is fancy and affordable all rolled into one. Few bars and clubs have been around as long as Bar Blu, one of the most fun places to spend an evening (and night... and morning) in Beijing. Surrounding Bar Blu is a collection of other bars and clubs that pale in comparison but in a pinch are also fun. This includes Kokomo, Baby oh!, Migas and Pure Girl bar. The Opposite House is one of the best hotels in the city, and it's located directly between Sanlitun South and Sanlitun North. Here you'll have access to the whole city, as well as the cool clubs, restaurants and art space located in the tiny hotel. Nearby are a few local options and the Sanlitun Backpacker's hotel, but the Opposite House takes the cake for best hotel in the city. 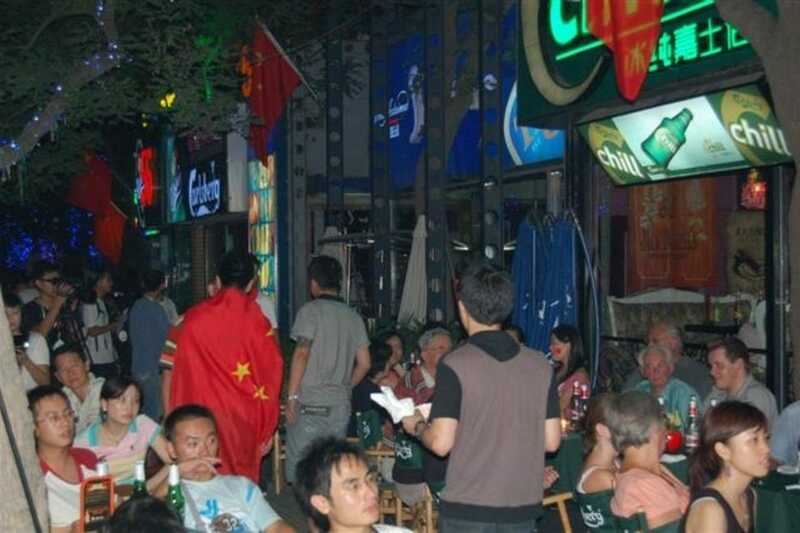 You'll also find the Hanting Express Beijing Sanlitun SOHO a great option in the area. Sanlitun Village is a cool shopping area that includes everything from Nike to Uni Qlo, to couture shops, and brand names like Dior and Versace. You'll find any item on your shopping list, and the basement even has a movie theater and grocery store. Sanlitun North is where the brand names are, and across the street at Sanlitun SOHO you'll find even more shops.